Roadside verges are becoming the last refuge for some of the rarest wild flowers and plants in the UK, according to a conservation charity. Plantlife is calling for better management of grassy verges to preserve a wealth of different flowering plants. It says road margins are a haven for wild plants that have been lost from the countryside. 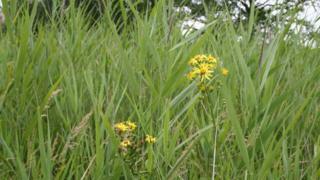 Some wild plants, such as wood calamint and fen ragwort, are now found naturally only on road verges. The charity says such plants can be brought back from near extinction, with conservation management. But it says even endangered plants on verges deemed nature reserves have been mown or cleared. For too long road verges have been thought of as "dull, inconsequential places that flash by in the wing mirror," said Dr Trevor Dines of Plantlife. "Sadly, road verges have been woefully disregarded for decades and are increasingly poorly managed for nature," he added. "Some exceptionally rare plants including fen ragwort and wood calamint are only hanging on thanks to the existence of some remaining well-managed verges. "But we must not get complacent - only genuine management for nature will safeguard these and other plants from extinction." Plantlife says verges should be managed for wildlife as a matter of course, while remaining safe for motorists. Wood bitter-vetch - once common in pastures of England and Wales, it is now near threatened. In the study, Plantlife found that 724 plant species grow on road verges in the UK. Of these, 91 are threatened or near-threatened. If ditches and hedgerows are included, this figure rises to 97 out of 809.